There was no better way to celebrate halloween than to eat at one of the most exciting new restaurants in New York. Reservations aren’t hard to get as of now, but then again, the restaurant is still only a few weeks old. Exec Chefs Jeremiah and Fabian both trained at very well-regarded restaurants, including Noma, Isa, and Jean Georges. In a recent interview with Eater, they described their restaurant as being heavily influenced by Parisian neo bistros, but quintessentially New York. The vibe of the place is very casual but also nice. At 5 courses for $55 with supplemental options, your money goes a long way and you get food that’s been prepared excellently. I’m a bit worried the kitchen won’t be able to keep up when they have full nights – our night was maybe at 75% capacity but there were still long breaks in the meal and the kitchen just looked swamped. Hopefully they figure out pacing and they see a lot of future success! Not the best bread, but it’s pretty good. The chicken fat added a subtle lusciousness to it, but it wasn’t too heavy-handed. 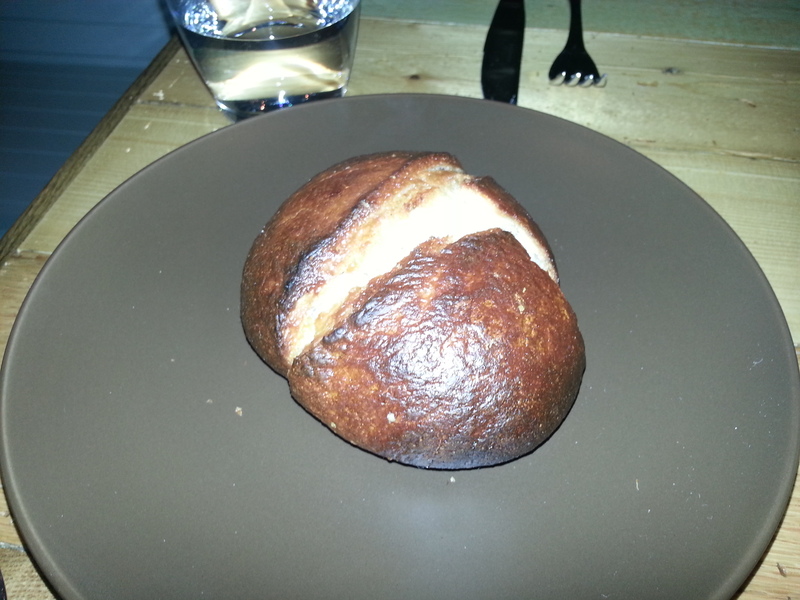 I liked how hot and crusty it was, but I wish the inside was less dense. I nitpick because it cost extra. 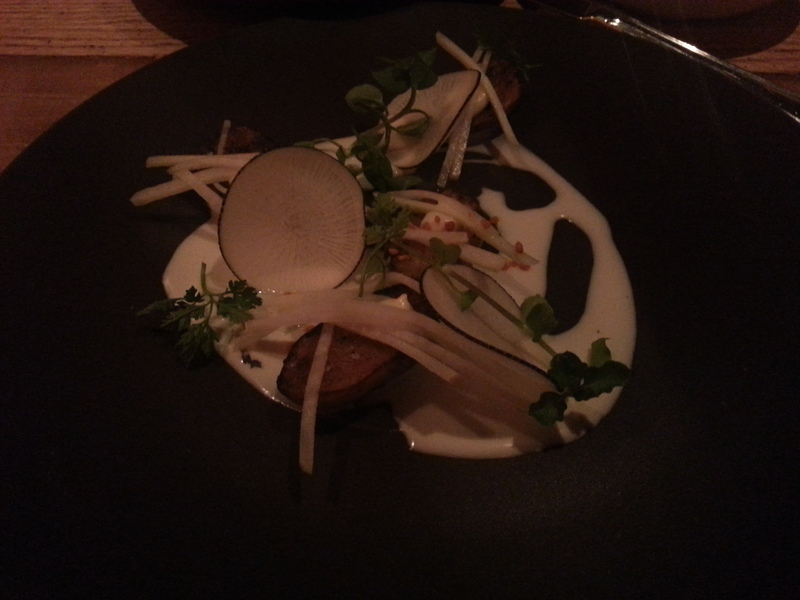 The sunchoke was amazing. It had this warm, pillowy, gnocchi-like texture that really comforted the soul. The sauce was a little bit like a runny yogurt, and added an ever so slightly tart/milkiness to the dish. 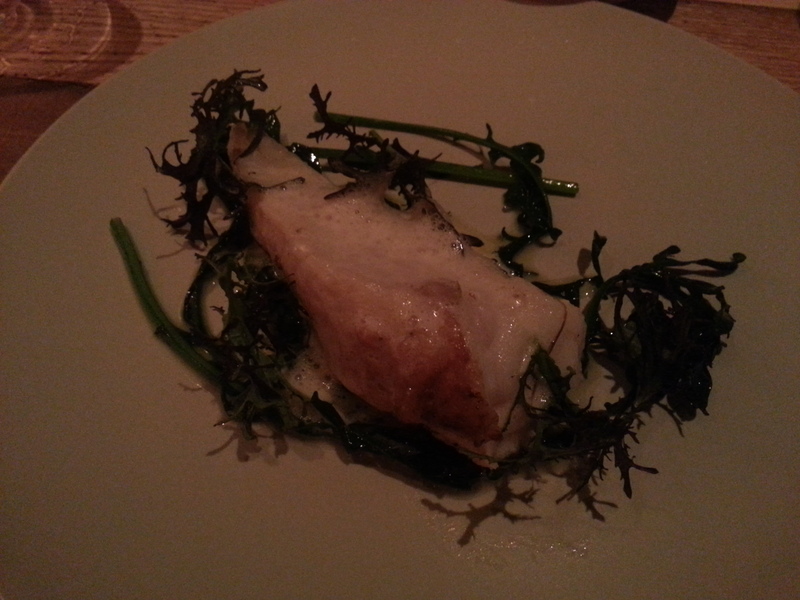 I feel like it’s very much like other dishes that I’ve heard of at Noma, and certainly reminded me of something from Atera. Just something earthy and warm. I’ve never had the actual filet of monkfish, only the liver. Turns out, it’s a very silky fish! It was quite tender, and fleshy. Almost like scallop in a way that the flesh parted. 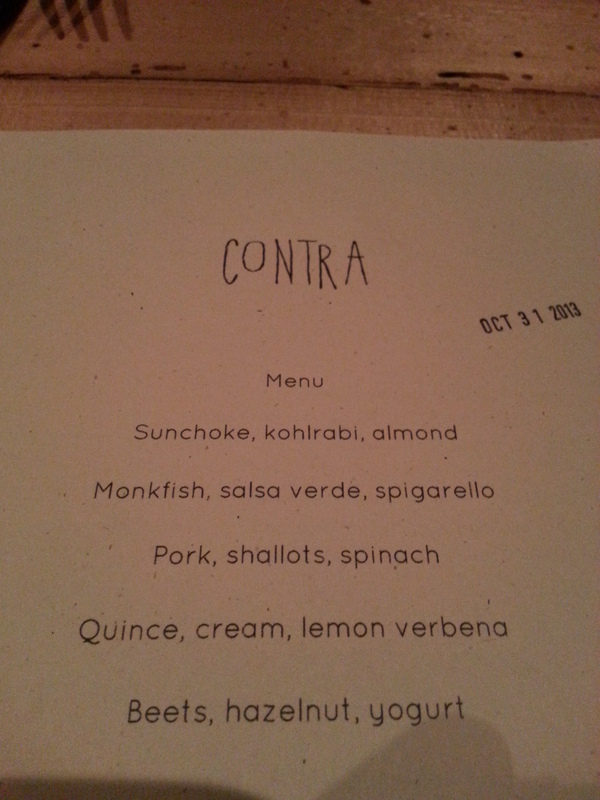 The salsa verde was a bit subtle and I wish there was more. The bitter greens contrasted well with the rich fish though. 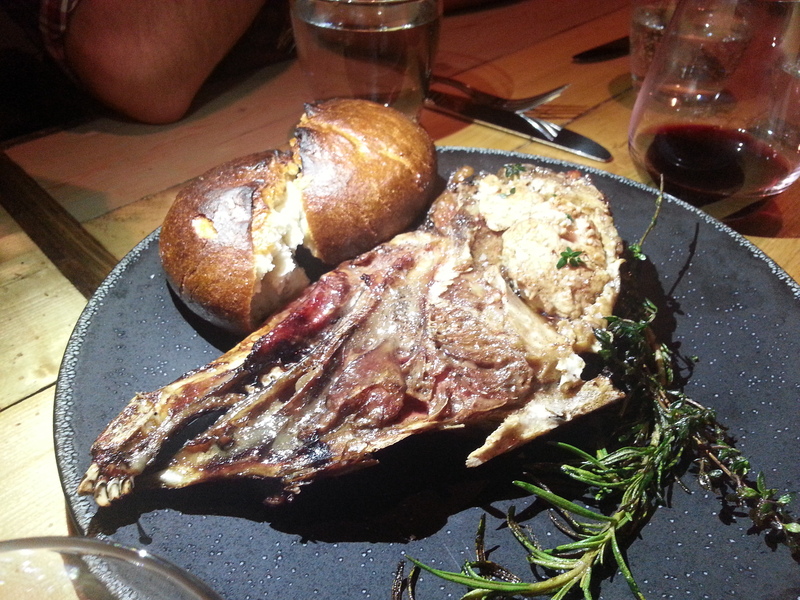 Supplemental Course: We ordered this lamb’s head to share, it was roasted with rosemary. Nothing better than scooping out giant hunks of lamb brain, amirite? It was really tender, fatty, and rich. I’m not sure that if you had told me it was bone marrow I would’ve been able to tell the difference. The face meat was also excellent, just like normal roasted lamb with great herbal flavors infused into it. Jeeebus this pork was delicious. It was just …orgasmic. Rich but not too much, tender, and amazingly just oozed of flavor. 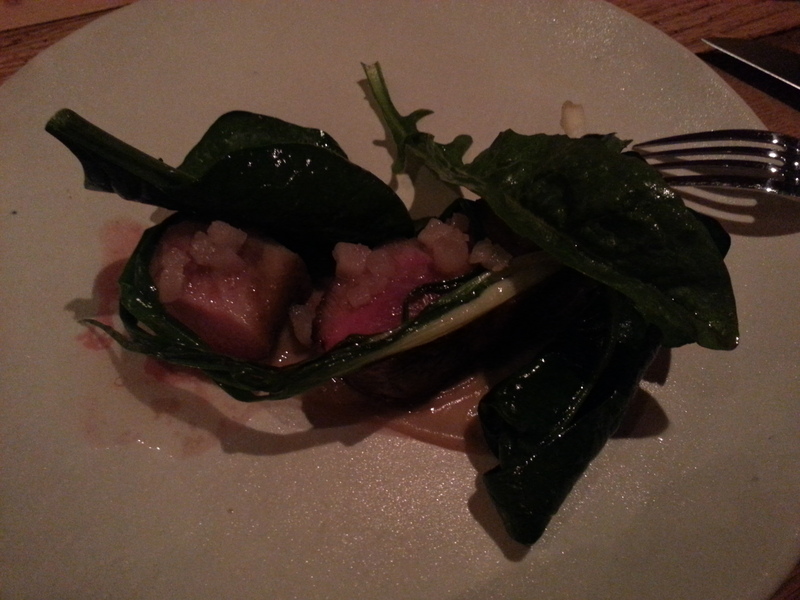 Again, the slightly grassy spinach and sweet shallots helped cut the richness of the meat. I always thought really wonderful palate cleansers could always be stand alone desserts, and it seems Contra thought just that. 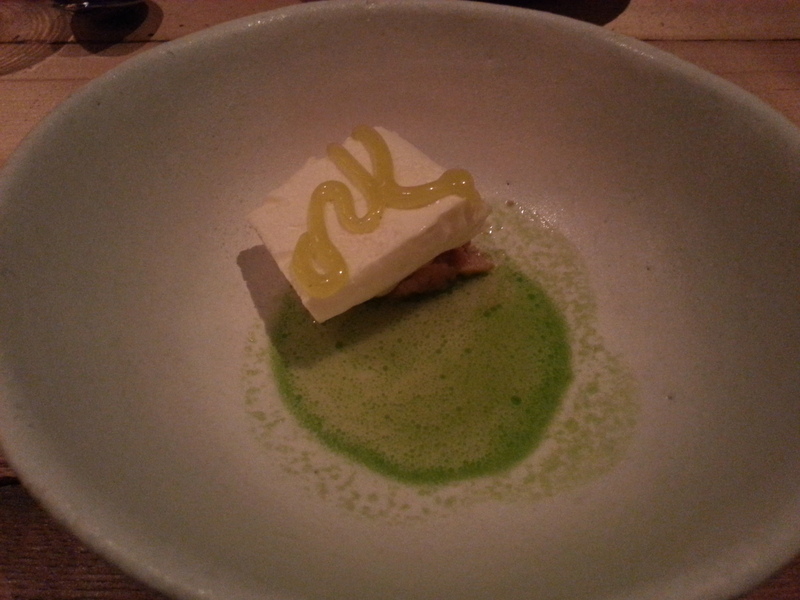 This dessert course was very light and refreshing, with its fluffy sorbet/yogurt texture and clean flavors. One of the most creative and odd desserts I’ve had in a while. The beet chips were quite “beety”, I assume they were dehydrated to concentrate the flavor. 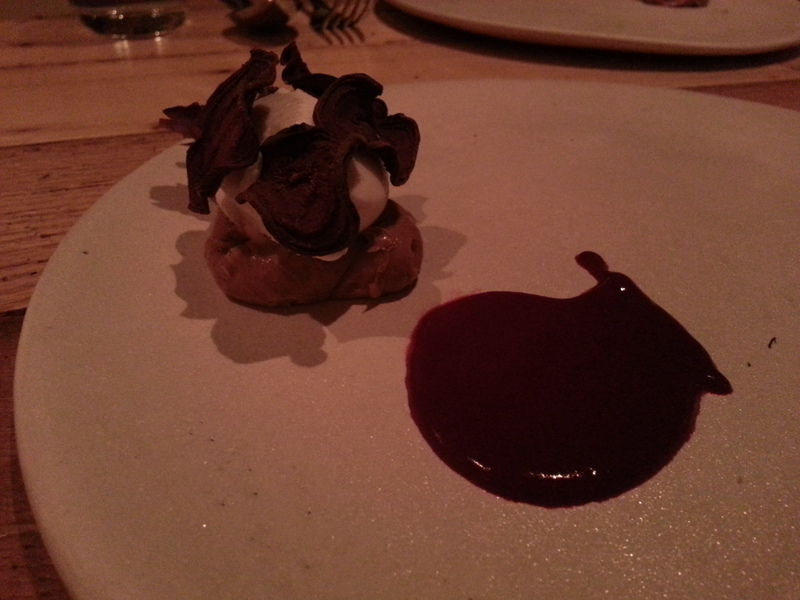 The milky yogurt and earthy beets again revealed a distinct style of cooking. This was definitely not too sweet, and almost seemed savory. I don’t love it for the flavor, but I must applause its ambition and creativity. The entire meal was quite enjoyable, and I’m glad New York has a new exciting place ! 9 Restaurant Trends That Tried To Ruin 2013 | シ最愛遲到. !